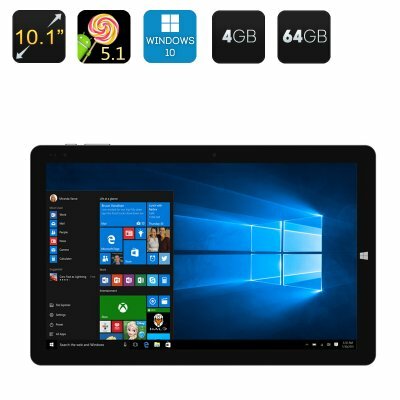 Successfully Added CHUWI HiBook Ultrabook Tablet PC - Windows 10 + Android 5.1 OS, USB Type-C, 4GB RAM, 64GB Memory, 10.1 Inch IPS Display (Gray) to your Shopping Cart. The CHUWI HiBook Ultrabook is a 2-in1 premium tablet that at 573 grams it's your portable companion for work and play on the go. With the CHUWI HiBook Ultrabook you will enjoy the Windows 10 and Android 5.1 capabilities as this 64Bit beast brings access to all the Android apps and Windows Tabs you want. Great news for Android games lovers who don't want to sacrifice the productivity of Windows as they can embrace the best of both operating systems. With 4Gig of RAM and 64Gig of storage that can be expanded to 128GB using the micro SD card storage this powerful performer incorporates Intel 8 gen graphics so games and movies will run seamlessly without dropped frames or lag. The 10 inch IPS display brings 1920 x 1200 (WUXGA) resolutions for high definition that's picture perfect. Sporting a Type-C USB port and micro USB OTG port as well as mini HDMI this tablet can transform into a powerful media center or desktop computer letting you hook up all your peripherals for lightening quick data transfers or greater productivity. The brushed metal effect finish and slim 8.5mm body will be sure to turn heads and what's more this CHUWI HiBook Ultrabook has support for a detachable keyboard (not included). With its 6600mAh battery you can enjoy great usage time and there are even front and rear cameras for snapping photos or getting some screen time with friends on chat apps and Skype. This CHUWI HiBook Ultrabook comes with a 12 months warranty, brought to you by the leader in electronic devices as well as wholesale Tablet PCs..